What to get mom for Mother's Day? Is she a young, hip mom that would benefit from something special that you can only get online? Maybe. Does she like fragrances? Is she into bespoke fragrances that are so special they are only made by one place? I have the perfect gift for her. PHLUR. PHLUR is a fragrance house that has so far created only 6 fragrances, of pure perfection, that are amazing. Seriously, these are to. die. for. I love them. They are unlike anything you will ever put on your skin. In face that is their tagline, fragrance made for skin, not paper. For Mother's Day you can do a special gift, in which the gift recipient receives a special personalized gift card, three sample bottles of fragrance that you have chosen for her/or they can help choose for her with her and a gift card for a full bottle of fragrance she can get after sampling the three scents, all for $95.00. This is a great gift to give and the scents that are sampled can be easy to choose because of the descriptive nature of the fragrances. They are all described pretty well. You will get a good idea of how the fragrance smells by the description. So far I had already tried MOAB and Olmsted & Vaux. Both of those I reviewed. Let me say this about them. MOAB is like being in the hot sandy arid desert. Under the sun, with it beating down on you and the heat radiating off your body. Sandalwood, musk, tonka bean. It is a rich and spicy scent that is so addicting. This could be a unisex fragrance. Olmsted & Vaux is bright, crisp and clean. It is revitalizing and ultimately what you think tweed would smell like. It is unisex also. Recently I tried samples of the last four scents I had not tried before. I was very excited to try them because I am such a fan of PHLUR. I am truly addicted to MOAB and Olmsted & Vaux. So I tried Hanami. It is described as having an aquatic floral tableau, with a reverent subtlety and warm embrace. It has a fresh, airy sensibility that is serious and penetrating as a zen koan (even if its wearer is not). Hanami is a fragrance that is a minimalist scent that reserves its most lasting, most memorable notes for those you allow to get close. The notes in Hanami come from fig, white florals, hazelnut, and sandalwood. Hanami's perfumer is Nathalie Benareau. It is a very light floral but not to be missed if you like these kinds of scents. Another scent I tried was Siano. A pure expression of elation. As enchanting as it is powerful. Lush and decadent, floral and a more than a little exotic, Siano is designed for that outgoing person, but made for more than going out. You know that moment in a great night when the music peaks and the dance floor begins to move as one? Siano is that in a bottle. Siano was designed by David Apel. I love this one too, it is addicting. I kept smelling my wrists when I had it on. It has the following in it: green pepper, ylang ylang, osmanthus, mimosa and cognac. I think it is the ylang ylang for me, I love that flower. Hepcat is another unisex scent. It has some elements that remind me of MOAB, that arid spicy and smokyness to it. I could sit and smell that forever. It is described as coarse and fearless meets smoky and raw. Maybe you live in Bushwick. Maybe you don’t. Maybe you know where that is. Maybe you don’t. Maybe you have a taste for all things hand-crafted and artisanal. Maybe you think those are make-believe marketing terms. Whatever the case, authenticity matters, and Hepcat will speak to you. No maybes about it. It is about truth and being authentic to yourself. The notes on this are dark and fearless: saffron, black vetiver, tobacco, and oud. Oud is a very spicy scent that will take any fragrance deep into the spicier realm. The perfumer is Nathalie Benareau. Greylocke is known as refreshsing and restorative. An expression of nature and New England heritage. Greylocke is the scent of tradition made new: thoughtful and refined, with a smidge of irreverence. It possesses an earthy vibrancy, like the calm that follows a rain, soft but striking. If you're looking to project the carefree ease of the Kennedys playing touch football, or just enjoy the heady blend of pine and the sea, this is your go-to. This one was designed by David Apel. 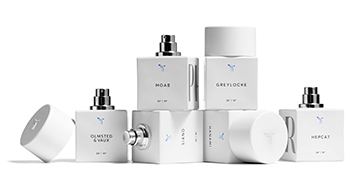 It has notes from the following: sea salt, bergamot, birch leaf, silver vetiver and pine resin.That is what gives Greylocke the refreshing scent and it is also another unisex scent that is earthy yet extremely vibrant from the bergamot. PHLUR scents are all amazing. I love each and every one of them. Yes it is true. I have never said that about any company's products before. But their fragrances are all so good and so easy to wear. They don't give me migraines, headaches whatsoever nor do they cause me to get sick. I love how long they last on the skin (some all darn day). And I love how they induce scent memories for me. PHLUR is purchased via www.phlur.com. Like PHLUR on Facebook: https://www.facebook.com/Phlur/; Follow PHLUR on Twitter:@phlurfragrance;Follow PHLUR on Pinterest:https://www.pinterest.com/phlur/ and Follow PHLUR on Instagram:https://www.instagram.com/phlur/.